While in Quartzsite I picked up several pieces that I thought would make a good base for beaded cabochons. This fused-glass one is the first one I have completed, I love the vibrant colours. I left the back of the cabochon exposed so that the glass could catch the light from time to time. 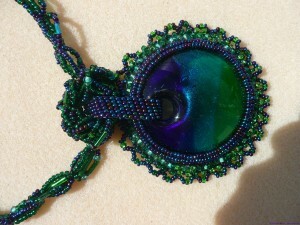 A coordinated bead chain was created for this piece. Approximately 23″ or 58 cm plus 3 in or 7 cm cabochon and closure.